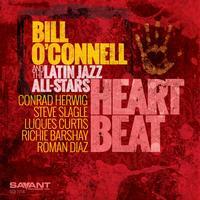 Here is the latest offering by Latin Jazz great Bill O’Connell, making his fourth release for the Savant label. Always one to seek out new ways to express his music vision, the pianist has throughout his career embraced a broad stylistic swath of jazz, Latin and Brazilian idioms while experimenting with an equally diverse orchestral formats, from a duo to unconventional trio settings and ensembles of various sizes. His well-known resume includes long stints as keyboardist and arranger for the legendary Cuban conguero Mongo Santamaria and Puerto Rican flautist Dave Valentín as well as engagements with a diverse array of jazz and Latin artists, from saxophonists Sonny Rollins and Gato Barbieri to trumpeters Chet Baker and Jerry Gonzalez. Here Bll is joined by his acclaimed group The Latin Jazz All-Stars, featuring Conrad Herwig, Steve Slagle and Cuban percussion great Roman Diaz.